haha, get it? Squirrel-ling around? Squirrel? heehee. hahaha. Sorry, I’m in a bit of a silly mood this morn. So, you wanna know what I saw yesterday? Well, I was on the phone w/ Mr. T; so I went out to our patio area at work so I can talk to him in peace. Yesterday was a pretty warm day here in Cleve. It was probably like 95-98 w/ the heat index factored in. Just like 3 feet in front of me is this drainage thing (b/c they really do over-water the foliage here). It was in the shade, so I figured the metal had to be all niiiiice & coooool. 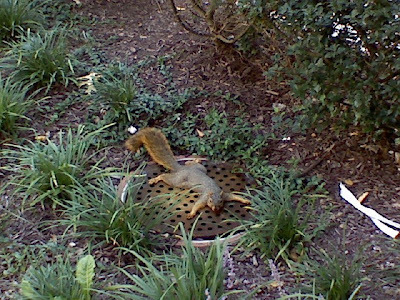 Why else would this squirrel decide to sprawl himself out on it? This sight really cracked me up. Oh, & I just got a new phone a couple of weeks ago. It’s the LG enV and it’s just the coolest thing EV-ER. It’s got an amazing camera on it, & the pic above was taken on my cute new lil camera phone. Did I mention it’s orange? So. CUTE! I’m calling it butternut though, I have a wallet that’s orange too, but on the label, it didn’t say orange, it said butternut. So, since the phone matches the wallet ex-act-ly, I’m calling the phone butternut too. See? Now you get it. Squirrelling around! heehee. That’s insane. I really thought the thing was dead at first. Nah, he would lay like that, get up, move around, & come back to lay sum mo’. AND, if you click on the pic to see it bigger, you’ll see that he was staring RIGHT AT ME! I have a few squirrel stories. I wonder if it’s an Ohio thing. I can’t believe you took that pic with a camera phone! Wow! I KNOW!!! Wait til you see it tonight; it’s so cute! And you know I don’t just go around saying that about everything… Oh, wait… I do.